Juniors took center stages on Saturday at the Tucson R48 V Stop #2 Memorial/Junior WPH Benefit, as four dozen junior stars from Arizona, California, Texas, New Mexico, Ohio, and Canada play small ball and big ball, competed in various target-hitting competitions, learned from the pros in instructional clinics, and staged the second edition of the Battle of the Border. Killian Carroll appeared in his first non-U.S. Open Race quarterfinal, aiming to defeat hometown Tucson hero and R48 #2 Luis Moreno. Carroll had defeated Moreno in their two previous encounters, including a thrilling 11-9 tiebreaker semifinal victory at the World Handball Championships in August. Carroll dominated Moreno from the outset in Saturday morning’s quarterfinal, racing to a 5-0 lead and never looking back. Carroll needed just 29 minutes to eliminate Moreno, executing nearly perfect serves and first-strike kills with flawless fundamentals. Lenning survived a first game deficit against a game Luis Cordova to take a one-game lead, 15-10. The second game mirrored the first, with Lenning never able to separate himself by more than two points in the game’s first half. With Cordova playing inspired handball and arguably his best handball since 2012, the Juarez prodigy tied the game at 10 for the second consecutive game. Lenning raced to a 14-11 lead and match point, Cordova rallied, scoring two points and earning a setup that would have tied the game at 14. Cordova was unable to convert, and Lenning closed out the match, 15-10, 15-13. Saturday’s first R48 semifinal produced an instant classic between Ortiz and Carroll. Ortiz raced to a 10-1 lead with sensational and unstoppable play, pinning Carroll in the deep court with power serves and first strike kills. Predictably, Carroll fought his way back into the match with great serving and tenacity, ultimately taking a 13-12 lead. Carroll was unable to convert a setup to score his 14th point and after a three-minute glove change, Ortiz rattled off three consecutive points to take game one, 13-12. Ortiz and Carroll battled to a 6-all tie in game two when Ortiz took over, finding the bottom board and overpowering his Irish rival. Ortiz scored nine of the final 10 points in the match to advance to his first final since the 2015 Player’s Championship in April. Lenning passed Peixoto in the WPH Power Rankings following the 2015 Simple Green U.S. Open for the first time in 10 months and the junior rivals found themselves battling for a spot in the Tucson Memorial in their 62nd career matchup. Peixoto raced to a 4-0 lead in his first service inning and seemed to be in complete control, but Lenning scored 15 straight points to stun Peixoto and take a one-game lead. Lenning continued to dominate in game two, scoring 22 of 24 points to take a 7-2 lead. Peixoto scored four straight to close the gap, but Lenning took over again, building a 14-8 lead and one point from the finals. Lenning appeared to win the match with a diving fist kill, but the WPH Video Replay showed the ball skipped. After celebrating outside of the court and removing his gloves and eye guards, Lenning was informed of the replay decision. Peixoto scored one point but Lenning ended what became an incredibly contentious match with a kill. The Big Ball stars also shined in singles and doubles, with the biggest Big Ball indoor field in R48 history dazzling galleries and ESPN viewers with sensational skills and acrobatics. Juan Santos proved that he is not only one of the top two outdoor big ball players in the world, but also one of the best indoor big ball players in the sport. 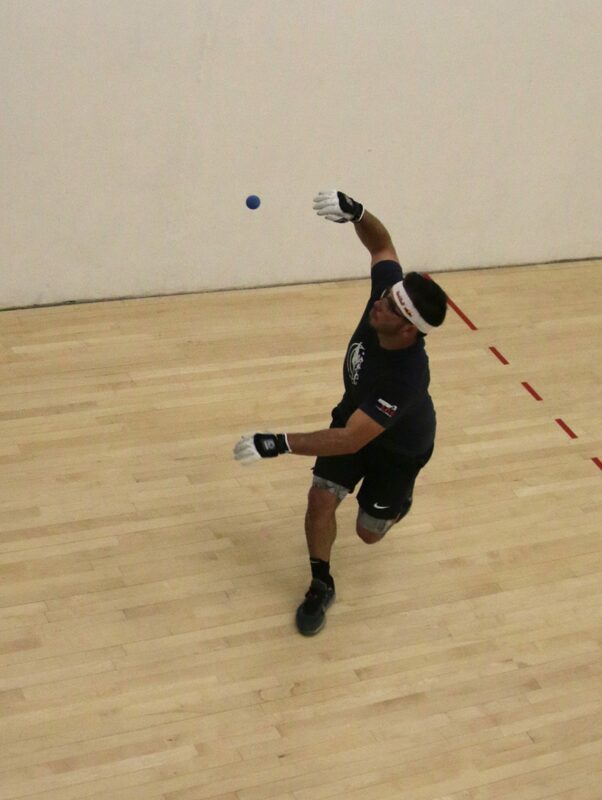 Santos defeated Rudy Cruz in two games in the Big Ball Pro Singles semifinals and teamed with Sal Duenas to defeat NYAC’s cross over stars Stephen Cooney and Jonathan Iglesias. Shorty Ruiz also advanced to the Big Ball Pro singles and doubles finals, defeated Luis Cordova in the singles semifinals and teaming with Timbo Gonzalez to defeat Rudy Cruz and Chava Cordova. Catriona Casey and Ryan Bowler formed a Canada-Ireland mixed doubles dream team and faced 2015 Simple Green U.S. Open Doubles Champion Vic Perez and his partner Jim Karkeek. Perez and Karkeek dominated the Canada-Irish Dream Team, needing just 24 minutes to claim the title 21-2.